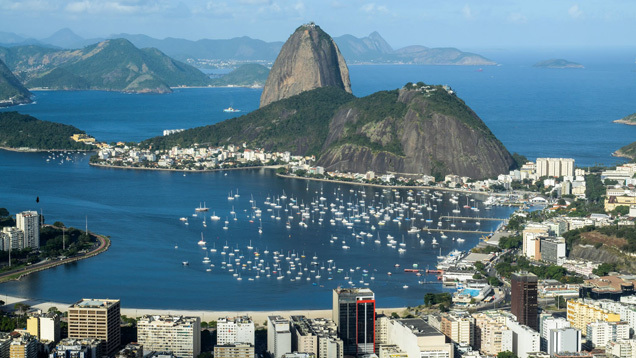 The natural and cultural elements of Rio de Janeiro influence many jewelry designers. I have traveled to Brazil many times over the last decade and witnessed tremendous changes there, including significant increases in its economic power and industrial development, and the emergence of women professionals. Accompanying these trends has been the rise of an incredible jewelry design and manufacturing industry. At the August 2012 Feninjer show in São Paulo, I witnessed the full spectrum of Brazilian jewelry design. And while viewing the styles on display at the show is very informative, to see them actually being worn by Brazilians helps you understand the jewelry’s cultural connection. Brazil’s jewelry reflects the sense of style possessed by its women. Like Brazilian fashion and style, the jewelry is often bold. Photos courtesy of Vianna Joais (left) and Manoel Bernardes (right). Designers in São Paulo, Belo Horizonte, and other cities are dedicated to capturing important elements of the domestic culture, creating styles that are uniquely Brazilian. The culture of Brazil is extremely rich and diverse. Portuguese settlers, indigenous societies, and Africans imported through the slave trade all contributed their own unique cultures. This cultural blend created a unique style. 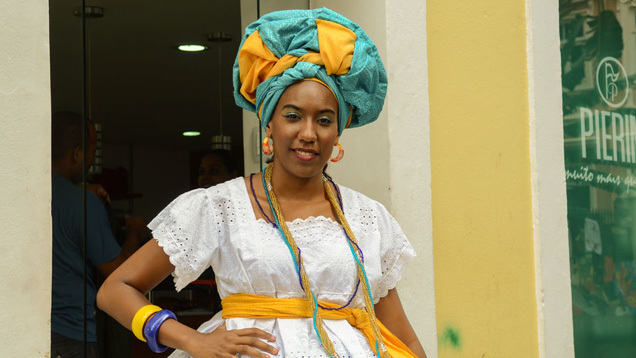 Afro-Brazilian culture has a strong influence on design. Besides cultural diversity, Brazil is also known for its natural beauty, from the lush jungles of the Amazon to the picturesque beaches and mountains and the incredible variety of flora and fauna. Brazilian jewelry always seems to reflect these design inspirations. 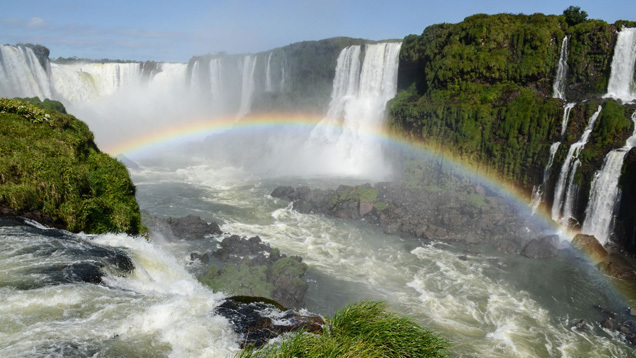 Brazil is a country full of natural wonders, such as Iguazu Falls, that inspire jewelry designs. Another contributing factor is the wealth of gemstones available there. Brazil is one of the most significant producers of a variety of colored gemstones, which are often incorporated into these jewelry designs. The liberal use of gemstone color creates a bold look. Cultural aspects such as music and dance are sometimes reflected in Brazilian jewelry designs. Courtesy of Vianna Joais. The cost of mining and cutting gemstones has risen steadily along with Brazil’s economy. Labor costs and government regulations have added significantly to operational costs, especially in the mining sector. For some mining operations, it is no longer being economically viable to produce certain gemstone varieties for the international market. International gemstone trading is usually done in U.S. dollars, which has created a sort of double penalty. As business costs have risen, so has the value of the Brazilian real against the U.S. dollar. As a result, it now costs considerably more to mine and cut gemstones in Brazil, and they receive less dollar value when they’re sold. 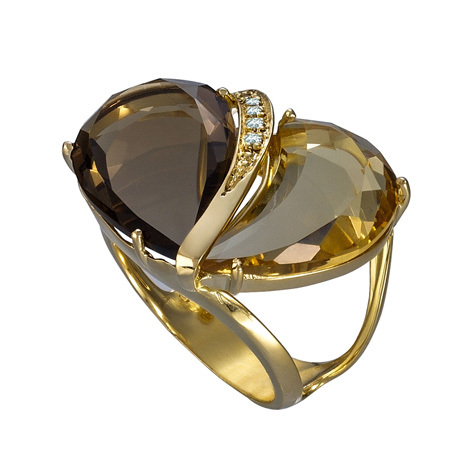 As costs have risen, many Brazilian companies have thrived by moving up the value chain into branded finished jewelry. Their uniquely Brazilian style incorporates many different domestic gemstones. The high value of the jewelry makes gem mining and cutting profitable again and creates new employment opportunities. 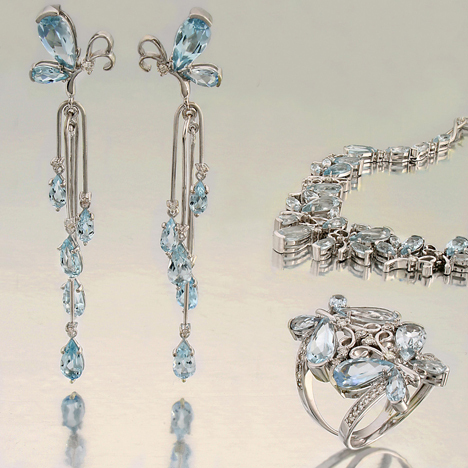 Brazilian jewelry designs are usually incorporated into matching suites. Courtesy of Vianna Joais. Manoel Bernardes has been a wholesale colored stone supplier for decades. The majority of its business is now in branded finished jewelry, which completes for them the entire mine-to-market supply chain. The company also has its own retail stores in Brazil. Vianna Joais is another company with brand power in Brazil and, through its exports, around the world. Its jewelry designs and suites incorporate a wide variety of colored stones. Earth tones signify the strong connection between Brazilians and their environment. Courtesy of Manoel Bernardes. 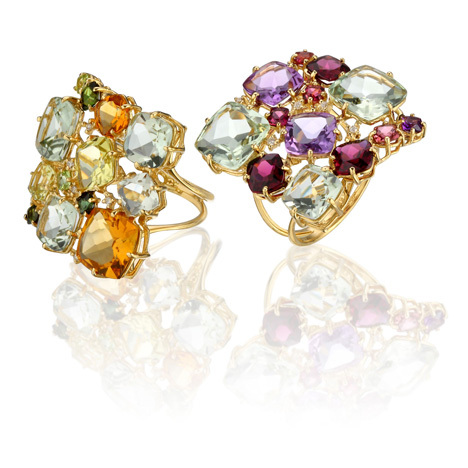 Brazilian designers are known for combining colored stones to create a rainbow of attractive colors in a single piece. This look has been very popular with the domestic market and is one of the Brazilian style themes recognized worldwide, thanks to a growing export market. 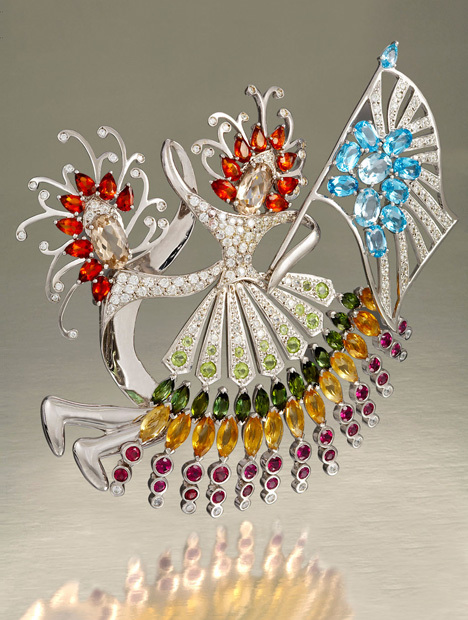 Brazilian designs often incorporate a variety of gem colors in a single piece. Courtesy of Vianna Joais. One key factor in all this is the Brazilian woman herself. She has a unique sense of style that is modern, fashionable, and versatile. She prefers jewelry that blends with nature, evoking a sense of free-flowing movement. Earrings that dangle are a favorite. Pastel colors are also a popular choice. Courtesy of Vianna Joais. 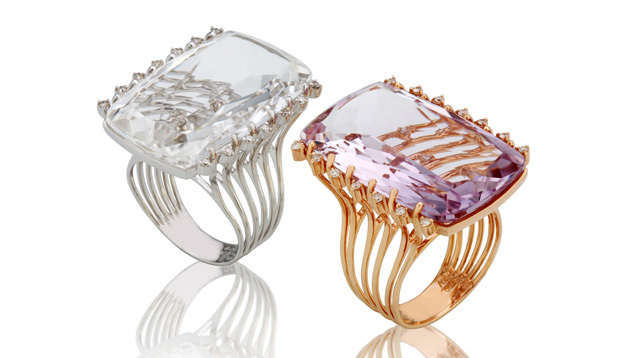 Brazilian women love both intense and pastel colors in gemstones. They often wear large stones or pieces with combinations of different stones. The wealth of stones includes aquamarine, morganite, blue topaz, yellow to imperial topaz, amethyst, citrine, green quartz, smoky quartz, rose quartz, various colors of tourmaline, rhodonite, iolite, and others. Brazilian women often incorporate large pieces of jewelry into their fashionable wardrobes. Courtesy of Manoel Bernardes. The Brazilian consumer often goes for the color rather than the higher-priced gemstones. While Brazil is a major source of emeralds for the world market, they are not among the more popular gemstones used in Brazilian branded jewelry, especially for the domestic market. Besides favoring less-expensive colored gemstones, Brazilians also make jewelry purchases and change styles more often than many other consumers. 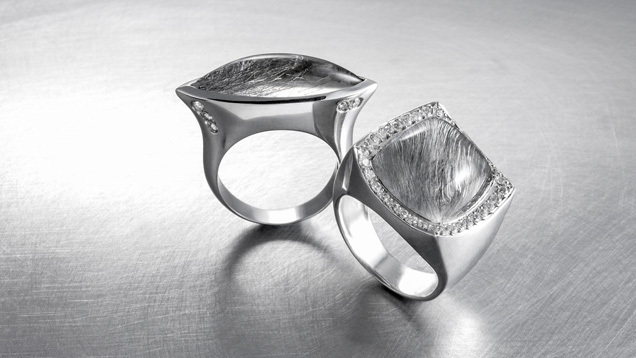 Many Brazilian jewelry designers come out with four brand-new collections a year. Because of domestic demand, this is almost a necessity. New jewelry lines often come out each season, to coordinate with the fashions Brazilian women will be wearing. Floral designs are especially popular in spring and summer. This design incorporates floral motifs and dangling gems. Courtesy of Vianna Joais. For brands such as Vianna Joais and Manoel Bernardes, vertical integration offers a great deal of design versatility. They are not confined to styles that use standard gemstone shapes and sizes. They can create asymmetrical shapes and non-standard sizes and incorporate them into their brilliant designs, while still producing sufficient quantities to create entire seasonal jewelry lines. While Brazilian designers are known for taking advantage of the full rainbow of gem colors, they also incorporate neutrals. Courtesy of Vianna Joais. This design philosophy also offers an economic advantage that helps offset the rising production costs. If rough gems from the mine are elongated, or have some other shape that would result in substantial weight loss for standard cuts, the designers can incorporate them in a way that retains a larger percentage of the stone’s original weight. While 18K yellow gold is the standard metal for Brazilian jewelry, 18K white and rose gold have been gaining popularity. Silver has also become more important, partly because its lower cost helps maintain the right price points for the domestic market. Brazilian jewelry makers can compete against lower labor costs elsewhere by incorporating unique designs and frequently introducing new lines. The manufacturing equipment and techniques are also constantly being updated and refined. Today, many of Brazil’s very talented and artistic jewelry designers are women. Besides the Feninjer show for designers and manufacturers selling to retailers, I also attended Techno Gold in São Paulo earlier in 2012. Techno Gold was aimed primarily at Brazilian jewelry manufacturers, and state-of-the-art equipment was displayed and sold at the show. 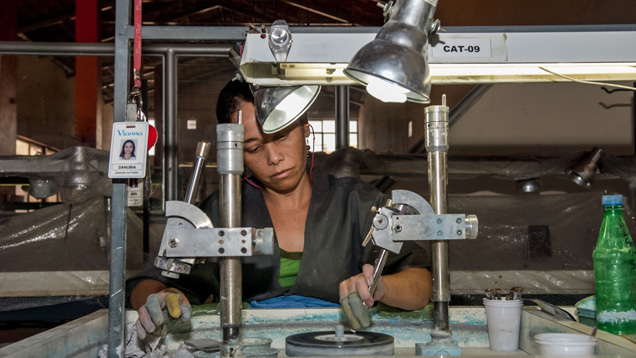 Many Brazilian jewelry brands have their own lapidary facilities where they can cut stones to any shape needed for their designs. The future of the Brazilian designer jewelry industry looks very promising. The country’s vast gem wealth lends itself to custom jewelry designs with an innovative style that incorporates Brazilian culture and natural beauty. Colored stone suppliers have offset higher costs by moving up the value chain into finished jewelry, satisfying the domestic market while also branding their style internationally. Meanwhile, trade organizations such as the Brazilian Institute of Gems and Precious Metals (IBGM) sponsor design contests and conduct some 80 training programs across the country, preparing the next generation of jewelry innovators. 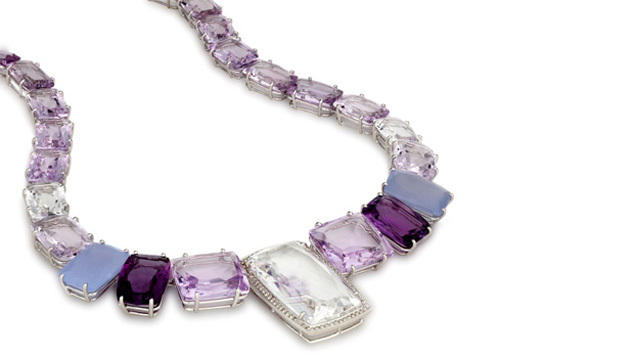 Brazilian designs often combine pastel-colored gemstones with darker or more intense varieties. Courtesy of Vianna Joais.